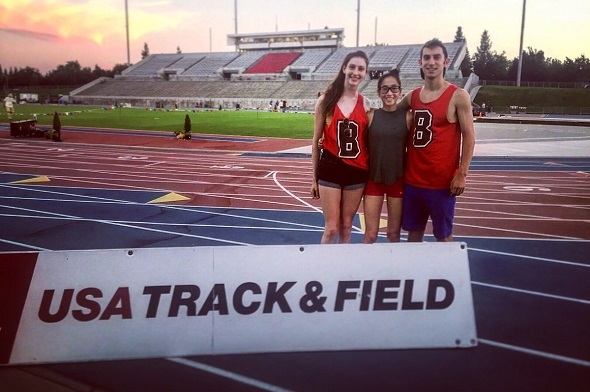 While the Ivy League grads excelled in international and club national championships this past weekend, the Ivy League youth excelled at the USATF Junior Nationals in Clovis, Calif., this past weekend. Athletes under the age of 20 from across the country had the opportunity to get a spot on Team USA for the IAAF World Junior Championships that will be held on July 19th to 24th in Bydgoszcz, Poland. The top 2 in a given event – provided they have reached the World Junior standard – make the team. Princeton’s Adam Kelly will be extending his outdoor season for another month as he earned a Team USA berth. Kelly finished as the runner-up in the 6kg hammer throw competition (high school weight) with a distance of 72.99m (239-09 1/2), easily surpassing the World Junior standard of 68 meters (223-01). The mark is over 5 feet better than his high school best with the same weight (234-02 according to Athletic.net). Another interesting tidbit about this performance is that Kelly will be travelling to Poland with his former high school teammate – Bobby Colantonio, a rising freshman at Alabama – as Colantonio won with a 74.12m distance (243-02). Three other athletes finished in the top 8 of their respective events. Penn’s Kevin Monogue (right photo with medal) was among the top contenders in the 10km race, racing among the top half of the pack. He made a move to the front in the last part of the race, sitting in third place with 1,200m to go. He dropped to fifth place at the bell lap but refused to let anyone else pass him on that final lap as he crossed the line in 31:05.59 for fifth place. Brown’s Eli Moskowitz (top photo on the right) was in a tactical 5km race. While he finished in sixth place overall in 15:31.22, he was in the midst of a finishing spread where fifth through seventh finished within 1 second of each other. Yale’s Austin Laut flirted with his personal best in the pole vault as he was able to clear 5.10m, but no higher as the height was good enough for seventh place overall. Kelly will be competing in Poland at the IAAF World Junior Championships from July 19th to 24th. Poland hosted this meet back in 2008, where former conference record holder in the hammer, Conor McCullough, earned the silver medal. This entry was posted on Tuesday, June 28th, 2016 at 7:00 am. It is filed under Athletes, Spotlight. You can follow any responses to this entry through the RSS 2.0 feed.